Amazing new fluid virtual interface. The future is now! Seen Minority Report? It’s inspired the latest current generation of user interfaces such as the iPhone and Microsoft Surface. But that’s all a load of old rope now since they all require a physical screen. The next generation is in development, a wearable computer that is able to recognise it’s environment, any pertinent objects and project a custom user interface on anything from walls to books to loo roll and even facially identifying someone in front of you and writing a tag cloud of their interest on their t-shirt. Continue readingAmazing new fluid virtual interface. The future is now! How often have you heard heard it said, “How much will it cost me to have new feature (x)?”. If you’re in business and you commission bespoke software or if you’re a software developer or project manager you’ll have heard this before. The truth is there are two answers to this question: “as cheap as possible despite making things harder in the future”, or “take the time now to re-factor (re-work) existing code to make a clean enhancement”. One of the best productivity investments any information worker can make on a Windows machine is to increase desktop real estate. 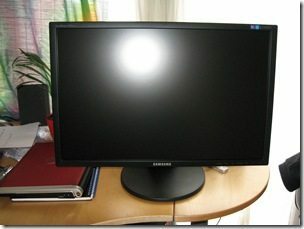 I’ve just added another 24” monitor to my workstation this afternoon, a Samsung SM2443BW display; the second Samsung display I’ve ever purchased (the first is an old 17” Syncmaster that’s still going strong after six years, now on Vicky’s computer).